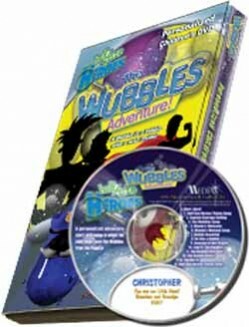 This Personalized DVD includes fun dance sequences and energetic songs from the action-packed album, “Half/Size Heroes, The Wubbles Adventure”. It explores the incredible rescue of the Wubbles (bubbles with a wish inside) from the Pop-Its, those meanies that want to pop the Wubbles. The lively music, dynamic sound effects and impeccable animation deliver an enjoyable experience. This video encourages imaginative possibilities, creativity and light-hearted fun.